A LABORATORY incubation experiment was carried out for ‎different time periods (0, 3, 7, 14, 30, 45 and 60 days) to study the effect of some organic wastes (farmyard manure, filter mud cake, ‎compost and poultry manure) with and without biofertilizer incubation on some soil chemical properties (pH, EC and OM), CO2 evolution, ‎and N, P and K release rates in a sandy loam soil amended with these organic wastes. The effects of different organic wastes varied depending upon ‎organic material type and the incubation period. The organic matter ‎content and the pH of treated soil decreased with increasing the ‎incubation periods especially with biofertilizer inocubation. 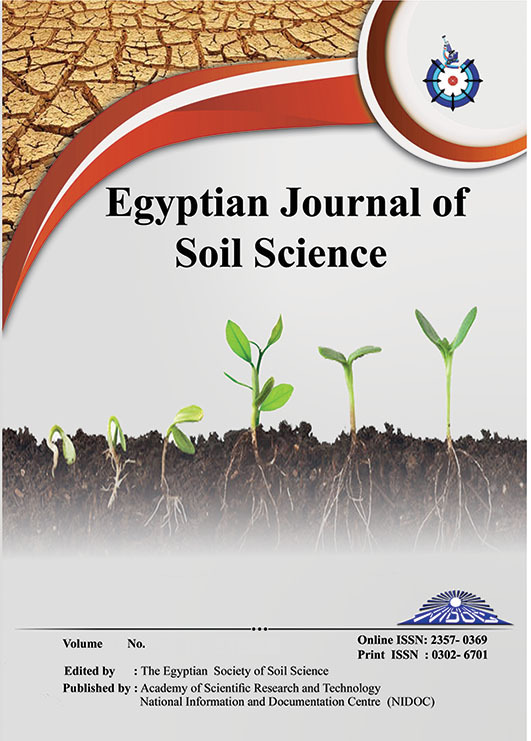 The soil ‎salinity significantly increased with adding each organic waste and ‎with increasing the incubation period. The cumulative CO2 evolution ‎level from each organic waste increased with the incubation time. The ‎highest Corg level that were mineralized were found in the poultry ‎manure amended soil, while the lowest ones were in the compost ‎amended one. The total amount of nitrogen, phosphorus and potassium released from each organic waste treated soil significantly increased over the control treatment with time to reach the maximum level at 45 days for N and P and after 60 days for K, particularly with the biofertilizer incubation. The highest released amounts of N, P and K were recorded in the poultry manure amended soil with adding the biofertilizer.